The 118th U.S. Amateur got underway after a 24-for-1 playoff (Ryan Lavner reports) Wednesday morning at Pebble Beach. Brentley Romine of Golfweek on the top three players losing in round one. Zhen Kai Bai aced the 7th hole and his mom caught it on her cell phone! Pepperdine's Clay Feagler holed out at 15 en route to a Round of 64 win. Stewart Hagestad finally made it to match play in the U.S. Amateur, defeating the dapper Harry Hall of England and his strong fisherman's hat. My story for Golfweek. Thursday's round of 32 tee times and other info. The Forecaddie is astonished as many of us were upon learning how many Drive, Chip and Putt finalists are competing in this week's U.S. Women's Amateur Four-Ball (nearly a 10% clip for DCP finalists). After Monday's round of 32, all but two were eliminated, reports David Shefter. The average of participant--18.1 for the match play--does raise questions about what this event has become. The USGA seemed to schedule the men's and women's four-balls at at time to discourage college players and make it easier for mid-amateurs to compete. At least on the women's side, the timing has been conducive to junior golfers and not so friendly to both college players (conference finals/regionals) and mid-amateurs (too early in the golf season). While I love seeing the young talent excel, it also calls into question who this U.S. Amateur Pub Links replacement is serving and if the April date is working for anyone. Parziale: “He’s a blue-collar kid from a blue-collar family from a blue-collar city"
Matt Parziale, the U.S. Mid-Amateur Champion, came into the Masters press center yesterday to discuss his tournament preparation and career as a firefighter. Mark Cannizzaro has a superb write up of Parziale's story, his comments and insights from friends and family. Also worth your time is Jim McCabe's Masters.com piece on the ties between Parziale, Thorny Lea and a former fellow member, Herbert Warren Wind. From his home a few blocks away, Wind would walk over to the club, entering at the 15th hole. Born in 1916, he began to play before age 10 and for years would say how Thorny Lea ushered him into a world of golf that he cherished forever. The repositioned (by two days) Latin America Amateur Championship is underway at Prince of Wales Country Club. A papal visit led to the event's original dates being altered by five days. Even Augusta National, the USGA and R&A stand down for the Pope! First Round: Saturday, Jan. 20: 3-5 p.m.
Second Round: Sunday, Jan. 21: 3-5 p.m.
Third Round: Monday, Jan. 22: 12-2 p.m. Final Round: Tuesday, Jan. 23: 12-2 p.m.
Championship highlights will air on Tuesday following the completion of play; viewers can check local listings for specific broadcast times. ESPN will provide event coverage in this year’s host country, as well as throughout Latin America. Other broadcasters include ESPN and ESPN2 (United States), Eurosport (Europe), Fox Sports Asia, Fox Sports Australia, SuperSport (Southern Africa) and TSN (Canada). All of the coverage will also be streamed live on the official event website, LAACgolf.com. Masters Chairman Fred Ridley discussed the state of the event with Todd Lewis of Golf Channel, and refreshingly, refused to say in year four if it's fair to know exactly what impact the event has had. Also, a return to the Dominican Republic for 2019 was announced Saturday. SANTIAGO, Chile –The Latin America Amateur Championship (LAAC) will return to Casa de Campo in the Dominican Republic for its fifth edition, which will be held January 17-20, 2019. Championship organizers made the announcement today during the 2018 LAAC currently underway at Prince of Wales Country Club in Santiago, Chile. We were priviliged to have the U.S. 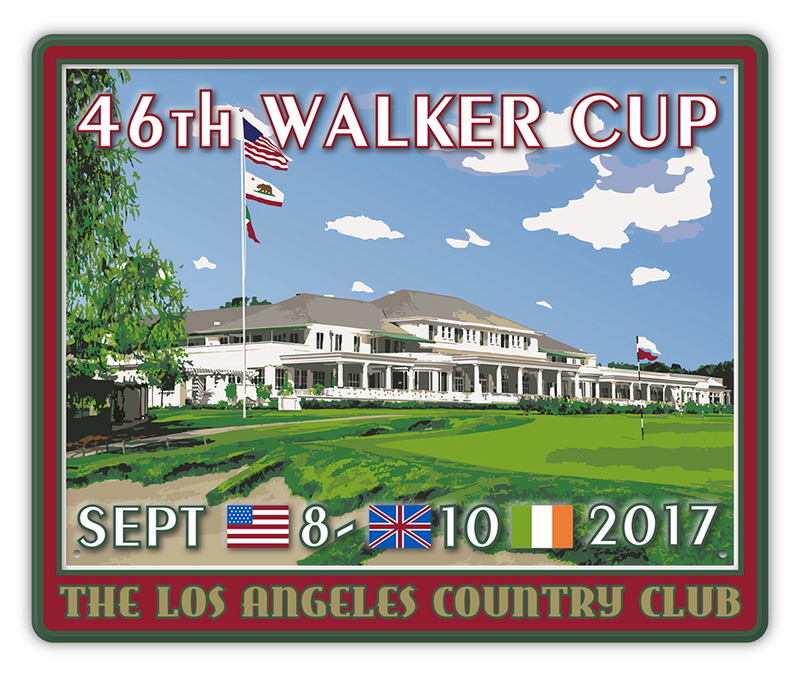 Amateur(s) and Walker Cup come to California and all three produced historic weeks with unforgettable moments. I was blessed to get to cover the U.S. Amateur at Riviera and Walker Cup at Los Angeles Country Club for Golfweek and reflect on where 2017 fits among the great years in amateur golf. 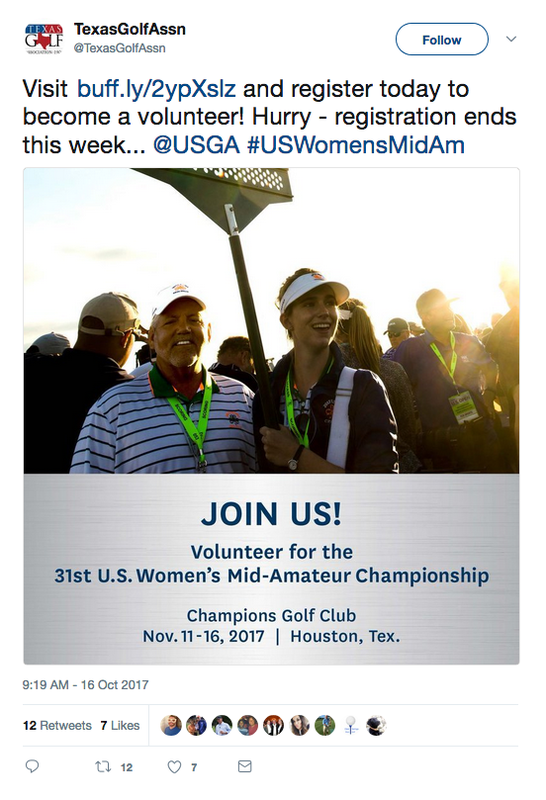 With the U.S. Women's Mid-Amateur moved to Champions in Houston after hurricane Irma caused damage at the original venue (Quail Creek in Florida), the short-notice move requires volunteers. For those in the Houston area, it's a great chance to hang out at legendary facility and help an amateur event and the Texas Golf Association, which is helping take on some of the responsibilities for the event November 9-16th could use volunteers. Here is their Tweet and the link to their registration page. Nice work by Golf.com's Dylan Dethier to interview and report on 30-year-old U.S. Mid-Amateur Champion Matt Parziale just hours after arriving home following a win that will send him to the Masters and U.S. Open. Parziale, 30, had taken time off from his full-time job in the Brockton, Massachusetts Fire Department to play this week's U.S. Mid-Am. He'd played in the event three times before, but had never won a match. This time, he won them all. "Oh, gosh, that'll be a good problem to have, I think," Parziale said when asked how he might work major championships in among his regular shifts. "None of that has sunk in, and everything is such a blur right now. I was trying to go through my phone, and everyone has just been so supportive, reaching out, following along, it's really been incredible." Parziale's father, Vic, is a member of the Brockton Fire Department, too. But he was in Atlanta caddying for his son. He, too, may need to find some time in his schedule for bigger gigs next season. U.S. Mid-Amateur: "Firefighter Parziale Faces Wedding Caterer Nichols in Final"
Brian DePasquale previews the U.S. Mid-Amateur final where a USGA trophy named after Bobby Jones, a Masters invite and a U.S. Open exemption are on the line. Matt Parziale, a firefighter from Brockton, Mass., and Josh Nichols, a wedding caterer from Kernersville, N.C., each won quarterfinal and semifinal matches Thursday to advance to Friday’s 36-hole final match of the 2017 U.S. Mid-Amateur Championship. The final is scheduled to begin at 8 a.m. EDT and will be held on the par-70, 7,207-yard Capital City Club’s Crabapple Course. For more coverage of the finals check out the official U.S. Mid-Amateur site. You may recall that post-U.S. Amateur(s) it was suggested the USGA revisit the insistence on a winner retaining amateur status to enjoy their U.S. Open exemption. While the newly announced perk by USGA President Diana Murphy is little different and we want the Opens to remain "open," news of exemptions for Mid-Am and Junior winners seems like a positive development from this week's U.S. Mid-Amateur. From Ryan Herrington's report for Golf World. During Thursday’s evening reception for the 264 players competing in this year’s U.S. Mid-Am, which begins on Saturday at Capital City Club in Atlanta, USGA president Diana Murphy announced that the winner will receive an exemption into next year’s U.S. Open. While some might see this as chipping away at qualifying spots for the U.S. Open and U.S. Women's Open--because it is--the move seems like a smart way to validate the importance of other national championships. Given that these winners get to the Sectional stage and many have qualified for the Opens anyway, it will give the events and amateur golf just a bit more of a boost. A shame but perfectly understandable to (A) postpone and (B) try to stick with the host venue over relocating. USGA Postpones 31st U.S. Women’s Mid-Amateur at Quail Creek Country Club in Naples, Fla.
FAR HILLS, N.J. (Sept. 12, 2017) – The USGA today announced that the 31st U.S. Women’s Mid-Amateur Championship, scheduled to be played Oct. 7-12 at Quail Creek Country Club in Naples, Fla., will be postponed due to the impact of Hurricane Irma. The USGA will continue to work closely with Quail Creek to determine when the championship will be played, and more details will be announced at a later date. For more information about the championship, visit www.usga.org/womensmidam. Dave Shedloski files a superb Golf World game story from the U.S. Senior Amateur at Minikahda Club where Sean Knapp won the U.S. Senior Amateur in his first year of eligibility. For a player who has had his share of moments in amateur golf, it's a great story. But winning after 43 USGA events, for someone who started the game at age 19, is something to behold in the era of short amateur careers. When you add the emotions of winning one with Knapp's late father very much on his mind, it's an incredible story you'll want to take in. An accomplished player in Western Pennsylvania, Knapp has been a fixture in USGA championships, twice advancing as far as the semifinals of the U.S. Mid-Amateur. In the 1995 U.S. Amateur at Newport Country Club, he defeated Notah Begay in a second-round match only to be stopped in the Round of 16 by eventual winner Tiger Woods. In 1998, he got to the quarterfinals at Oak Hill C.C. Poll And Question: Best Ways To Boost The U.S. Amateur? I'd ask you to consider some points made in this Golfweek column related to the state of the U.S. Amateur before voting. Because even in the aftermath of a classic final match and a week in LA where many players enjoyed the experience of a lifetime, it is apparent that the U.S. Amateur is not quite the championship it once was. Over the decades, tweaks have been made to the format in the name of keeping the event prestigious and it feels like it may be time for those closely associated with the caretaking of America's best amateur event to consider a few tweaks. --Ranking incentive? As mentioned in the Golfweek piece, the it may be time to consider some exemptions to match play for top-ranked amateurs, which would incentivize them to remain amateurs and reward summer performance leading into the U.S. Amateur. The World Amateur Golf Ranking would also get a huge credibility boost. --Day and date change. The U.S. Amateur has always fallen near the start of school for those on the semester system and traditionally falls on a Sunday finish against other golf. Perhaps being played a couple of weeks earlier and finishing on a less competitive day will restore some prestige. Other events on the USGA calendar may be moving (Herrington/Golf World) so why not consider the Amateur as well? --Perks for semifinalists and finalists. We know that exemptions to the U.S. Open disappear when a player turns professional, as do free passes to U.S. Open sectional qualifying. This is why winners of semi-final matches seize on the Masters invitation and not the U.S. Open exemption, prompting the USGA to bring the U.S. Open trophy to the first tee. It's time to reconsider. --Lose the logos. While it's difficult to pin down the impact, the sight of players sporting company affiliations does not exactly cry amateur golf or improve the event. Years ago the NCAA made players cover college affiliations in non-NCAA competitions, but it may be time to ask players to not look like professional golfers at the U.S. Amateur. Best way to give the U.S. Amateur a boost? I've put out feelers with those who would know better and have asked: where did the 2017 U.S. Amateur final rank with the great ones they recall. I'll get back to you on that but in the meantime, as far as events I've been lucky enough to cover, Doc Redman's win over Doug Ghim at Riviera will rank with any golf display I've seen. Yes, it was the dreaded nobody-should-lose situations, as any 37 hole Amateur final would be appropriately labeled. No player was ever more than two up, and while there were a few loose shots, the quality of shotmaking and course management over a long, intense day was astounding. The two closed morning play with a 31 (Redman) and 32 (Ghim), making them nine-under on the back nine before the lunch break. The most remarkable part? No one following the match all day was shocked by the eagle make to keep Redman alive and one down with one to go. I've never seen anyone make that many feet of putts at Riviera. Oh, and the Western Amateur runner-up had never seen the course until this week and it was his first foray on kikuyu. Take that, local knowledge! Ron Driscoll's game story at USGA.org covers all the nuts and bolts from an epic day. Little was known about the 19-year-old from Raleigh, N.C., until the recent Western Amateur, where he steamrolled the best field in amateur golf en route to the finals. In the championship match against Norman Xiong, Redman fell 4 down at the turn, but he chipped away at his deficit, lipped out a putt to win on the 18th hole and ended up taking Xiong to 22 holes before eventually falling. “A lot less dramatic,” he said with a wry smile. Golfweek's Brentley Romine tells us about Redman's background and recent golf spurt that has him now on the Walker Cup team. For as good as Redman is in golf, he’s equally as brilliant, showing in interest in the stock market and securing a math internship at Clemson. Clemson assistant Jordan Byrd said after Redman came to him after his first semester and asked how he could get into the Honors College. “No one’s ever asked that before,” Byrd said. Ghim said the fact neither could get apart from the other all morning and afternoon was “testament to how good we played. For most of the day we stepped up and executed. Whenever someone got in the lead we knew it was probably going to last for awhile unless we could pull off an incredible shot. Both guys were just waiting for a moment to maybe try to take a chance, but no one really wanted to because it was so risky. Four times in the first 18 holes, the players tied each other with birdies, including on the difficult 18th. And Redman's last hole birdie to send the match to sudden death. 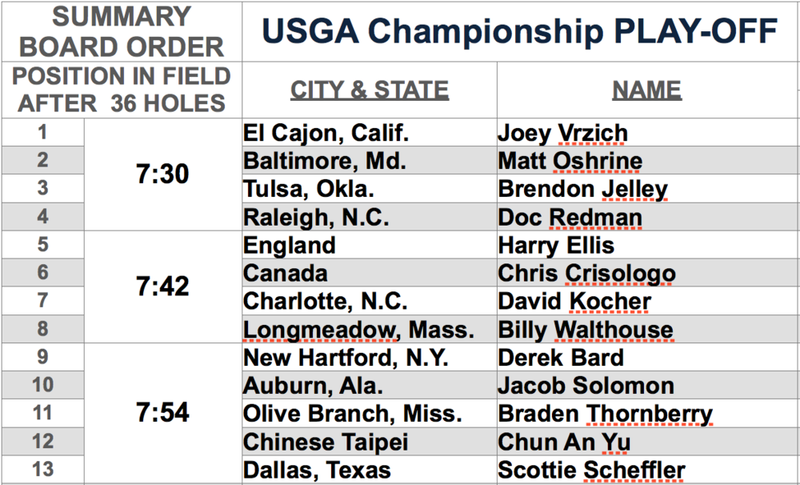 Other fun stuff from the USGA, starting with the early morning highlights. And the later day highlight reel that won't disappoint. The full final round photo gallery includes some beauties from Chris Keane in a really nice gallery format. Better work today Angelenos on the attendance front! You were treated to a pair of U.S. Amateur semi-finals that reached the 17th and 18th holes. Remember, you park for free at Paul Revere Junior High and can get a free shuttle ride to the club next door, so no excuses for skipping out on a chance to walk the perfect kikuyu fairways at Riviera. Plus, you'll be treated to the joys of match play, which includes strategizing, emotions and other micro-dramas that you won't enjoy just watching on television.It just so happens that you'll also be treated to some world-class golf is Saturday's semi's are any indication. Doug Ghim defeated Theo Humphrey 2&1 and Doc Redman beat Mark Lawrence 1 up, setting up Sunday's 36-hole finale at Hogan's Alley. Brentley Romine at Golfweek.com writes of Ghim's emotional swings in defeating the feisty Humphrey. The dramatic win, which also gets him in the U.S. Open should Ghim remain an amateur, comes just a few years after a near-miss at the U.S. Amateur Public Links that cost the Texas golf team member a Masters invitation. Ryan Lavner with that side of the final story for GolfChannel.com. The quality of the golf has been solid to ridiculously good given the stakes and difficulty of Riviera. USGA Highlights from the Ghim and Redman wins. Kids take note: both finalists wore pants in their semi-final wins. Meet them here in this USGA video. Official image galleries from the matches, which capture some of the proceedings played under perfect conditions. Sadly Fox Sports 1 has Bundesliga Soccer to air Sunday morning (priorities! ), so the first 18 of Gihm v. Redman is only viewable on USGA.org. The afternoon round coverage begins at 4:30 pm ET on big Fox. Medalist Hayden Wood, of Edmond, Okla., broke the U.S. Amateur Championship 36-hole stroke-play qualifying record with a total of 131 at Riviera and Bel-Air. The score is impressive on many levels given the firmness and speed of greens and launguid pace of play brought on my ball searches (no spotters and few marshals). Wood followed his 64 at Riviera with a 67 at Bel-Air to break the 132 record set by Hank Kim in 1994, Gregor Main in 2011 and Bobby Wyatt in 2012. As I write for Golfweek, Wood will face the last player out of Wednesday morning's hole-by-hole playoff where 8 spots are available for 13 players. They start on Riviera's 10th. Streaming details here. Tom Hoffarth with the lowdown on SoCal players for the LA Daily News. AmateurGolf.com's roundup of notes from round 2.